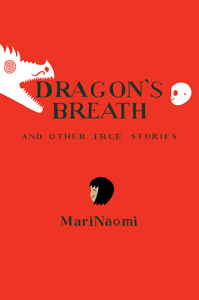 A month after running away from home in 1988, MariNaomi walked in the inky blackness along a beach with some people she obliquely refers to as her “new friends.” “It was so dark,” she writes in “Independence Day,” a chapter of her new graphic memoir Dragon’s Breath and Other True Stories, “that when I lit my cigarette, the flame lived on in my corneas long after it had gone out.” There is perhaps no more apt metaphor for the stories and vignettes in Dragon’s Breath than this: something that flares bright in your vision and lingers long after it’s extinguished. MariNaomi, a comic artist, writer, and author of Kiss & Tell: A Romantic Resume, Ages 0 to 22 and the long-running Estrus Comics, brings stunning moments from her childhood, adolescence, and adulthood to rapturous life in these pages. In the spirit of Alison Bechdel’s Fun Home and Marjane Satrapi’s Persepolis — both symphonically structured, partial-Bildungsromane that move backwards and forwards in time — Dragon’s Breath confronts the fragmented landscape of memory. First appearing at The Rumpus under the name “Smoke in Your Eyes” — several chapters of Dragon’s Breath can be read there — this book spans childhood to adulthood, examining race and queerness, cycles of terrible relationships, work, death, and Duran Duran, not necessarily in that order. The art is deceptively spare, but there is so much happening in the black and white spaces surrounding her figures. The gaps glow with ideas and emotions unspoken. The art style also changes from chapter to chapter — some panels fill the pages to the edges and are overwhelming in their dark palette; some seem ordinary in proportion, confident; others fill the space around small figures with words, words, words; and others still have a minimalist, sketch-like quality and barely occupy the page at all — and they aren’t always chapters, or even stories, in the traditional sense. Some have complete arcs, and others are just splinters of memory. Situations and characters emerge, vanish, loop back, hide, and return later, reinvigorated with the confessions and reveals in between, or never come back at all. Some stories resolve and others yawn open, unsettled. These vignettes feel as real as anything: after all, life isn’t a cohesive narrative; that this text is fragmented is honest and oddly comforting. Within these stories is a portrait of intersecting lives — family members, friends, neighbors, teachers, co-workers. And at the center of it, MariNaomi — sweetly rescuing a clutch of baby bunnies; tough in the steel-toed boots of her adolescence; nihilistic as she works at a movie theater; struggling in her relationships; observing the streets of her city and honestly assessing the humanity of its people. In the eponymous story, she learns that her beloved late grandfather was a violent, racist alcoholic and tries to reconcile this with her own memory. In “Gone,” she is sixteen and spending time with her beautiful, doomed, older boyfriend and the skinheads, anarchists, and drug dealers tearing apart their house. In “When You’re Young,” she remembers a gay co-worker from the restaurant where she worked who gave her money for a leather jacket — “When you wear it, always remember who you are,” he tells her over her protests — but she cannot recall his last name. Another chapter about a co-worker from a different job, “What’s New, Pussycat?”, reminds us how frequently our lives intersect with the lives of people who may one day be significant to us, even where we’re not expecting it. A horrifying chapter about bedbugs — “Sleep Deprived,” which will send any city-dweller in paroxysms of body-horror — serves as an apt metaphor for an ill-advised relationship. “Inner Beauty” ends with a photocopied image of an article about the suicide of Chris, who first emerged in “Gone” and later threw himself to death in front of the BART train, drawing an umbilical cord between these narrated memories and the stark, irrefutable nature of the artifact. In between all of these stories are countless other moments of keen observation, humor, and sorrow, too many to catalogue. We are living in the golden age of the graphic memoir. Ever since Art Spiegelman’s Maus earned heaps of critical praise and a 1992 Pulitzer Prize, many talented writers and artists have chosen the form to bear witness to the complexities, beauty, and terrors of their own lives. But what is it that makes Dragon’s Breath, along with its contemporaries, so compelling? In his book Understanding Comics: The Invisible Art, Scott McCloud puts forth a theory: people’s internal perception of their own faces — unlike their perception of, say, the face of their conversation partner — is sketchy. He argues that when a reader sees a photograph or realistic portrayal of a human face, they see it as another person. “But when you enter the world of the cartoon,” he concludes, “you see yourself . . . the cartoon is a vacuum into which our identity and awareness are pulled, an empty shell that we inhabit which enables us to travel to another realm. We don’t just observe the cartoon, we become it.” This is a theory by which the satisfaction of Dragon’s Breath, and the appeal of the graphic memoir, can be at least partially understood. Slipping into the identity of the book’s subject becomes part of the experience — part of the radical empathy that is so important with the memoir. There is no room for judgment between these pages or in this genre; rather, only compassion. Which brings us back to “Independence Day.” As teenaged MariNaomi and her companions walked along that beach, on that night, their footprints lit up the sand with a phosphorescent glow. As one of them began to explain the scientific phenomenon behind the illumination, she continued to stomp her feet into the ground, hard and with purpose. On the page, she step step steps away from them, and us, until she is a bright blotch on a dark horizon. This contrast seems important: if you hold Dragon’s Breath in your hands — the physical object of the book — and turn the fore edge toward yourself, “Independence Day” is a line of black between white pages. The moment that MariNaomi writes about here is brief. It spans a few pages and is mostly empty space. But it is the heart of the whole book; its emotional center. To read it is to feel lost for a few seconds, and then found again. Like the glowing footsteps on that beach, it would lose something in the analysis. Perhaps it simply needs to be experienced. Carmen Maria Machado is a fiction writer, critic, and essayist whose work has appeared in The New Yorker, The Paris Review, Granta, AGNI, NPR, Los Angeles Review of Books, VICE, and elsewhere. She is a graduate of the Iowa Writers’ Workshop and the Clarion Science Fiction & Fantasy Writers’ Workshop, and lives in Philadelphia with her partner.